Kevin's Watch :: View topic - WHAT DOES LINDEN AVERY LOOK LIKE? HELP ME OUT! WHAT DOES LINDEN AVERY LOOK LIKE? HELP ME OUT! Posted: Tue Feb 26, 2008 5:58 pm Post subject: WHAT DOES LINDEN AVERY LOOK LIKE? HELP ME OUT! Okay. This has been driving me nuts. I think we all have developed clear images of most of SRD's characters (I now can only think of Hugh Laurie as TC thanks to HOUSE). So what recognizable actress, model or public figure does Linden Avery look like? I've never had a clear picture in my head of the woman. Help me out! Post a picture or give me a description of who you think she's supposed to look like or at least who you believe she resembles. My sanity is now in your hands. Now THAT never occurred to me. Lindsey Wagner never annoyed the crap out of me so I guess I never made that mental connection. I saw V the miniseries the same year that I first read the Chronicles, and so I've had the image of Faye Grant as Linden in my mind ever since. It didn't hurt that Faye's character in V, Julie Parrish, was also a doctor. Your link doesn't work MM but I managed to google her name and found some other pix. Yeah. I recognize her from V and other things and I can understand why you identify with her. I'm trying to think of someone who both has light brown or blonde or "Wheaten" hair who has irritated me through peformances as much as the Linden Avery character has. So far all I can think of is Sharon Stone in Total Recall. When Arnold finally puts a bullet through her forehead and announces "Consider that a divorce!" it was pretty satisfying. But Linden was never THAT irritating. I just have found her at times very frustrating in that she "LOCKED UP" physically and emotionally so often in the second Chrons. I'm liking Linden a lot more in the Last Chrons. but visual images still aren't coming to me. I'm still not feeling it. The casting threads in the Movie forum would give you some good ideas. The first page of TWL gives you the specifics: long wheaten hair, good figure, etc. Edit: Ooh, Faye Grant is a good call! I'm still firmly in the Naomi Watts camp, tho. Thanks WF. I have traditionally avoided those discussions for a number of reasons but I may force myself to visit for this reason. I always thought Lindsey Wagner was a good choice. Thanks, guys, I'm glad you see merit in my choice. And sorry about the link. 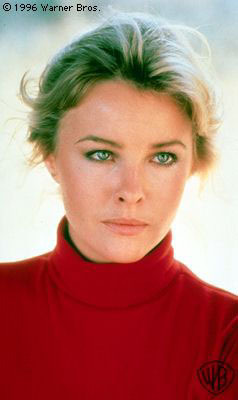 A minor confession: I had a major crush on Faye Grant during her time on Greatest American Hero and especially during her turn as Julie Parrish on V. Yet another reason why I look back on the early '80s so fondly. I thoroughly agree that Naomi Watts has the Linden "look" as well. Posted: Thu Feb 28, 2008 8:12 pm Post subject: Re: WHAT DOES LINDEN AVERY LOOK LIKE? HELP ME OUT! Scientia non habet inimicum nisp ignorantem. Fratres, quod in vitae spatium agimus in aeternum resonat. Posted: Thu Feb 28, 2008 8:31 pm Post subject: Re: WHAT DOES LINDEN AVERY LOOK LIKE? HELP ME OUT! But while I don't think of TC as British, I used to when I first read LFB because of all the odd curse words like "bloody" and "bloody hell". Unless someone here in the Land lives in a place in America where they talk like that...I know I don't. I do remember thinking, SRD doesn't have any "F" bombs in the first 2 Chronicles, but in the last ones he does. There are also several pictures of Linden which are available, for anyone wondering what she looks like. Posted: Thu Feb 28, 2008 9:45 pm Post subject: Re: WHAT DOES LINDEN AVERY LOOK LIKE? HELP ME OUT! Well, my boss uses those all the time. For him, I think it's an affectation he chose, but for what it's worth, he grew up in Virginia. Lindsey Wagner is a perfect match. I watched the Bionic Woman all the time so I know her voice and her mannerism from that show anyway. She would have been a great match. Well, every time I see the name Kenaustin Ardenol I think of the 6 Million Dollar Man, so I guess Lindsey makes sense. Oooohh, do you think the Theomach wears a dodgy red tracksuit? Ooh! When Theomach uses his "magic", do LA and friends hear "Nuh Nuh Nuh Nuh Nuh Nuh Nuh"? And, since Theomach can manipulate Time, that's why things slow down when he does his bionic thingy?